It was one of the biggest tech headlines of the year in September, Apple dropped its contract with Google, which had always supplied the data for the iPhone's Maps app. For various strategic reasons, Apple preferred to write a new app, based on a new database of the world that Apple intended to assemble itself. As everybody knows by now, Apple got lost along the way. It was like a 22-car pileup. Timothy Cook, Apple's chief executive, made a quick turn, publicly apologizing, firing the executive responsible and vowing to fix Maps. For a company that prides itself on flawless execution, it was quite a detour. Rumors swirled that Google would create an iPhone app of its own, one that would use its seven-year-old, far more polished database of the world. That was true. 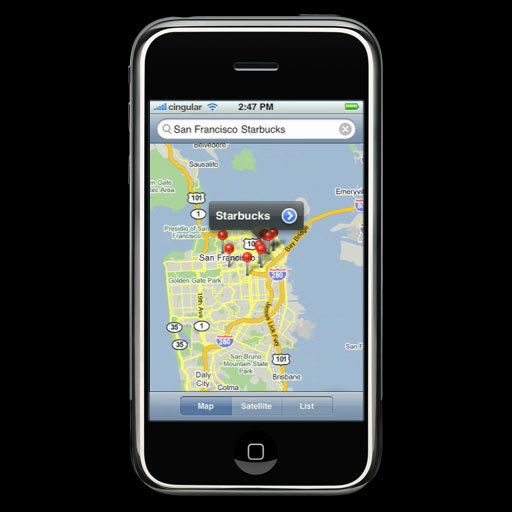 Today, Google Maps for the iPhone has arrived. It's free, fast and fantastic. Now, there are two parts to a great maps app. There's the app itself - how it looks, how it works, what the features are. In this regard, few people complain about Apple's Maps app; it's beautiful, and its navigation mode for drivers is clear, uncluttered and distraction-free. But then there's the hard part: the underlying data. Apple and Google have each constructed staggeringly complex databases of the world and its roads. The recipe for both companies includes map data from TomTom, satellite photography from a different source, real-time traffic data from others, restaurant and store listings from still more sources, and so on. In the end, Apple says that it incorporated data from at least 24 different sources. Those sources always include errors, if only because the world constantly changes. Worse, those sources sometimes disagree with one another. It takes years to fix the problems and mesh these data sources together. So the first great thing about Google's new Maps is the underlying data. Hundreds of Google employees have spent years hand-editing the maps, fixing the thousands of errors that people report every day. (In the new app, you report a mistake just by shaking the phone.) And since 2006, Google's Street View vehicles have trawled 3,000 cities, photographing and confirming the cartographical accuracy of five million miles of roads. You can sense the new app's polish and intelligence the minute you enter your first address; it's infinitely more understanding. When I type "200 W 79, NYC," Google Maps drops a pin right where it belongs: on the Upper West Side of Manhattan. Apple's Maps app, on the other hand, acts positively drunk. It asks me to clarify: "Did you mean 200 Durham Road, Madison, CT? Or 200 Madison Road, Durham, CT?" And then there's the navigation. Lots of iPhone owners report that they've had no problem with Apple's driving instructions, and that's great. But I've been idiotically misdirected a few times - and the trouble is, you never know in advance. You wind up with a deep mistrust of the app that's hard to shake. Google's directions weren't great in the app's early days either, and they're still not always perfect. But after years of polishing and corrections, they're right a lot more often. The must-have features are all here: spoken driving directions, color-coded real-time traffic conditions, vector-based maps (smooth at any size). But the new app also offers some incredibly powerful, useful features that Apple's app lacks. Street View, of course, lets you see a photograph of a place, and even "walk" down the street in any direction. Great for checking out a neighborhood before you go, scoping out the parking situation or playing "you are there" when you read a news article. Along with driving directions, Google Maps gives equal emphasis to walking directions and public transportation options. This feature is brilliantly done. Google Maps displays a clean, step-by-step timeline of your entire public transportation adventure. If you ask for a route from Westport, Conn., to the Empire State Building, the timeline says: "4:27 pm, Board New Haven train toward Grand Central Terminal." Then it shows you the names of the actual train stops you'll pass. Then, "5:47 pm, Grand Central. Get off and walk 2 min." Then, "5:57 pm, 33rd St: Board the #6 Lexington Avenue Local towards Brooklyn Bridge." And so on. Google's points-of-interest database also excels. For example, if you look up a restaurant, you can read the Zagat write-up, read customer reviews, read the menu or even book reservations, right there on the info screen. For 100 restaurants, you can even see interior photos. A single button-tap starts navigation to that restaurant. Compass Mode lets you hold the phone in front of you; as you move it left, right, up and down, the phone's view of place changes accordingly, letting you look all around. It's wild. It's "The Matrix." It's visual teleportation. Google has even managed to incorporate Google Earth, its zoomable photographic model of the entire world and its oceans. You know, just in case you want to know not just where a building is relative to Detroit, but relative to the Mariana Trench. It's a lot of features. The big question: How well did Google cram them in without sinking the app with featuritis? This, it turns out, is the best news of all. The brand-new, completely rethought design is slick, simple and coherent. Google admits that it's even better than Google Maps for Android phones, which has accommodated its evolving feature set mainly by piling on menus. The new software conceit here is the horizontal swipe. Plotting a trip? Maps shows possible routes on the map; a banner at the bottom summarizes the current traffic and time to destination. Swipe the banner to see the next proposed route. Look up "Italian restaurants?" A banner shows the ratings and average price for the first one; swipe to see the next restaurant's details, and the next. And when you're navigating, the current driving instruction appears in a green banner; swipe it to look ahead at the next instruction. (Apple's navigation mode doesn't permit you to look as if you're looking down at the world from a plane, the type sizes of place names contribute to the sense of perspective. They get smaller as they get farther away. So yes, Google Maps for iPhone is a home run. It is not, however, without its footnotes. The biggest thing you give up is Siri integration. If you say to your iPhone, "Give me directions to the airport," Apple's Maps app opens automatically, your course charted. It takes more steps to get started in Google Maps. Finally, although Google Maps runs fine on the iPad, it's just a blown-up version of the iPhone version. There's not yet an iPad-specific app. Apple just did a big mistake.